During October my goal was to learn about Indian sweets and desserts. Although I didn’t have the time or experience to make all the wonderful things on my list, I am glad that I took time out to learn. I looked through many books and magazines for Indian dessert recipes and ideas, but the most useful tool in my research was the Internet. Here are a list of wonderful sites where I found lots of inspiration and many of the recipes that I made. 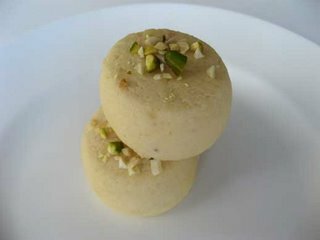 If anyone knows of any good sites or books on Indian sweets and desserts, please let me know, I would greatly appreciate it. This week I made gulab jamuns and malai peda. Gulab jamun is the first Indian dessert I tried and I still love it as much as the first time. If you haven’t tried it, think of round cakey dumplings fried and soaked in sugar syrup lightly flavoured with orange blossom water. I made the peda, because I was interested in using khoya (concentrated milk solids). The malai peda has a smooth fudge like texture, which is flavoured with cardamom and decorated with pistachios. 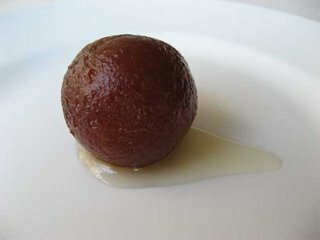 Gulab jamun made with flour, milk powder, sugar, almonds, cardamom and ghee. Malai peda made with khoya, sugar, cardamom and pistachios. its wierd. I'm Indian, but i cant stand indian sweets! The only one i like is Burfi. If you have the time see if you like that one. Gulab is the only dessert I will eat that is Indian...I wondered if you were ever going to make it...and you did! These Indian sweets posts have been just beautiful.